JUNIOR CODERS LEARNING CENTER PROVIDES A CREATIVE, INSPIRING, COLLABORATIVE ENVIRONMENT FOR LEARNING COMPUTER SCIENCE. Programs are structured to nurture creativity and invention in young minds, integrating core skills with development and leadership. Students receive a meaningful foundation in digital literacy, computer science technology, and information management. My son has been attending Junior Coders since the beginning of this year and has told me on multiple occasions that he really enjoys learning scratch and programming the dash and dot robots. The staff are incredibly helpful and accommodating! Thanks! Junior Coders is a fun place to learn and get introduced to coding. Both my daughters started at the ages of 8 and 6, and 2 years later have learned how to think logically and use basic scratch and python programming. I highly recommend this program to anyone interested in getting their kids involved. The teachers are also great with the children. 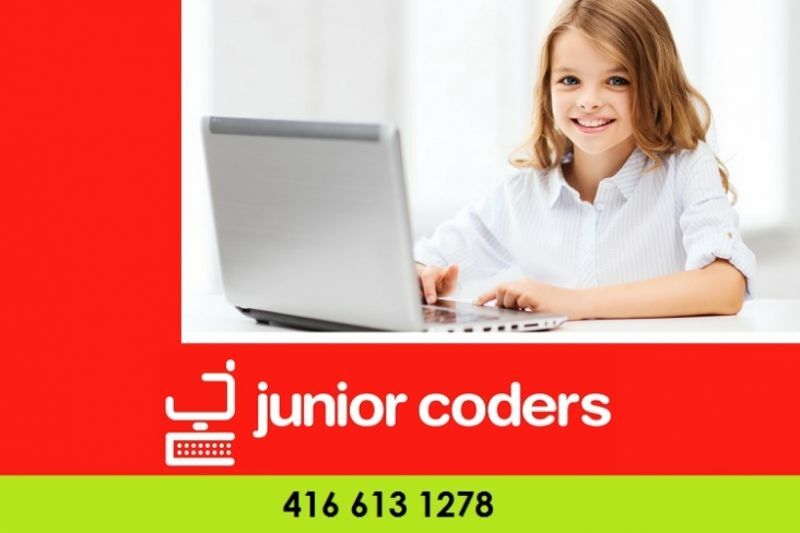 Junior Coders is a great place for kids to learn computer coding. My daughter loves going to Junior coding classes. The staff is very friendly and helpful. My seven years old daughter has improved a lot in her computational thinking and problem-solving skills over the last six months. Highly recommended place for kids in Brampton. My son loves it here. Learning new skills & building cofedence with every class. His teacher is amazing. I am so glad that there is such an opportunity in Brampton for children. My 10 year old son's favorite after school program. It's the first place I don't have to beg him to do his homework!!! I can highly recommend Junior Coders as a meaningful after school program! Junior Coders is an excellent program which introduces young minds to the world of programming. Our children are excited to go to class every week and thoroughly enjoy their time working with Dash and Dot. The staff is enthusiastic and encourages the children to learn while having fun. We are happy to have found Junior Coders and highly recommend the program! 11 year old learning Python! Excellent learning environment. The unit is clean and bright. The teachers and the owners are very easy to deal with as well as knowledgeable. The class schedule is extremely flexible. I would highly recommend this coding school to all parents. Learning to code is very important in today's fast paced world. My son has been doing the class for a year now. He's moved on from scratch and now at 11 years of age is learning Python. My 2 children (ages 10 and 7) began attending weekly classes at Junior Coders when the business first opened about 1 year ago. Both my son and my daughter love it! They have learned so much about computer design, robotics, using SCRATCH, and coding in general. I couldn't be happier. They come home very proud of what they did in class and my son is always so proud of himself when he has completed his homework assignments. The experience has been so beneficial for my son, in particular, that he has already decided to become a Computer Engineer when he is older. Benny and the team of teachers are really wonderful and make all the difference! Environment that enable them to do that in it self would pay dividends later. Junior Coders is an exciting, well researched, and thoroughly presented format of allowing young minds to grasp the fundamentals of computer science in an easy-to-follow manner. The feedback from the kids is proof enough - they always say they enjoy their class, and they always look forward to going back, and as parents, we've never had to force them to learn. Ben and the instructor team are doing a wonderful job. Every school should have this type of curriculum integrated at their core. Best place for kids to learn coding and robotics. Friendly teaching environment. Best computer programming place. Teachers and staff are very helpful, and also teach very well. It starts off easy with fundamentals of Scratch, but then will develop further in Python. Definitely recommended. I love the place!!! The teachers are very helpful and guiding. Most off all they know what they are doing and are very skilled in there jobs. Also there is room to progress. You start simple with scratch, and dash and dot but you can move on to higher levels like Python with Arduino or Rasberry-Pi. If you want a bigger challenge than most places, than this is the perfect place to go. It is just simply the best robotics and coding place I have ever gone to!! !